And For Your Next Holiday Abomination…. Always remember, I try to be tolerant. A candy cane staking an orchid? Tacky but not horrible. Maybe folks do love the blues ones. I am just not one of those folks. Here again, if we all loved the same thing, there would be no blue poinsettias, for one thing. There would also be no blue phalaenopsis orchids–in just this same shade of blue I might add! That’s also something you’ll never see darkening my door, even though both the orchid and the poinsettia in the blue shade would technically, I suppose, fit right in with my décor. But no. I have to draw the line somewhere. 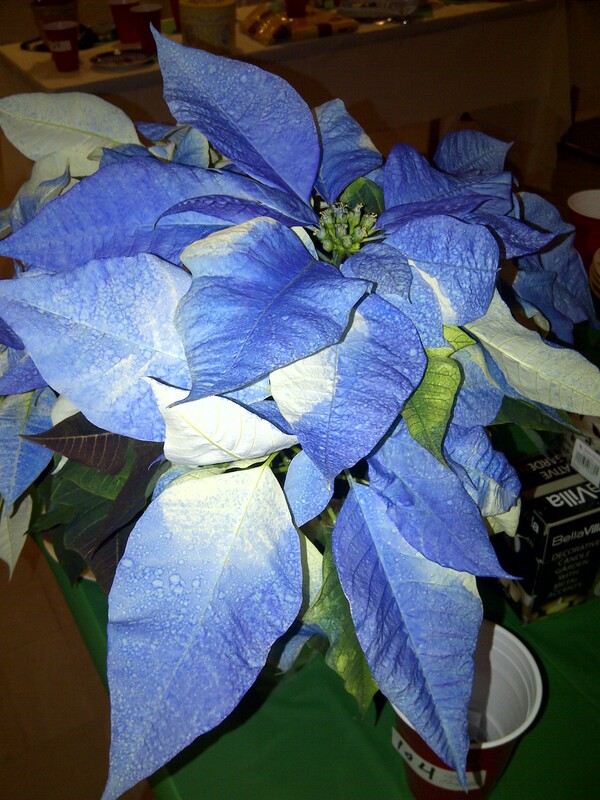 For those of you that love the blue poinsettias, please, enjoy them with abandon! Maybe the red ones are too garish for you. They surely can be, particularly once the holidays are over. As for me, I gave up on poinsettias a few seasons ago. My house is just too darn cold!